"Information is your new crop!" proclaimed John Deere's brochure, announcing the company's newly launched GreenStar Precision Farming System. But what did that mean? Corn, wheat, soy—those were crops. How would you harvest information? And more importantly, why would you want to? It's easy to imagine that those were questions John Deere's customers may have asked themselves as they opened the brochure. Historically, farmers used to plow, plant, weed, and harvest by hand. Hard as it might be, the effort gave farmers a personal connection to the land, making them confident that they understood the soil, the health of their crops, and the size of the harvest. Even with the coming of animal- and then gasoline-powered machinery, farmers were still confident in their traditional knowledge. After all, seeing is believing. Or not. It turns out farmers were not always right. Without detailed measurements and good record-keeping, farmers often did not fully appreciate which parts of their fields excelled or why. Equally important, they were not always convinced that investing in improvements in drainage, hybrid seed, fertilizer, or new technology was worth the cost. Enter precision farming. By the late 1990s, an agricultural revolution would be well underway, with new technologies allowing farmers to "see" bigger variations within their fields and animals than they had ever imagined. GPS (Global Positioning System), a key part of precision farming, was first developed for military purposes. The system became operational in 1978. Its military usefulness was demonstrated during Operation Desert Storm, when coalition troops with receivers were able to navigate quickly and with great precision in the relatively featureless desert. The development of GPS technology was a key part in this revolution. The U.S. Department of Defense began developing a satellite-based global positioning system (GPS) in the 1970s. 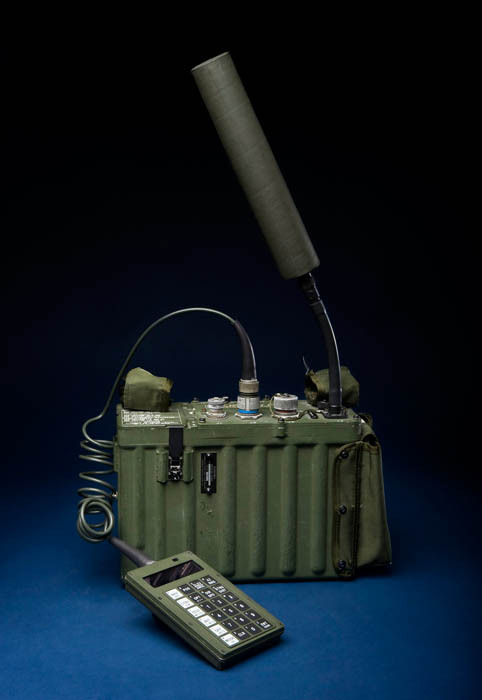 The system was intended for a range of military applications for which locational accuracy was important. By 1986 enough satellites were in place to make the system usable for other purposes. 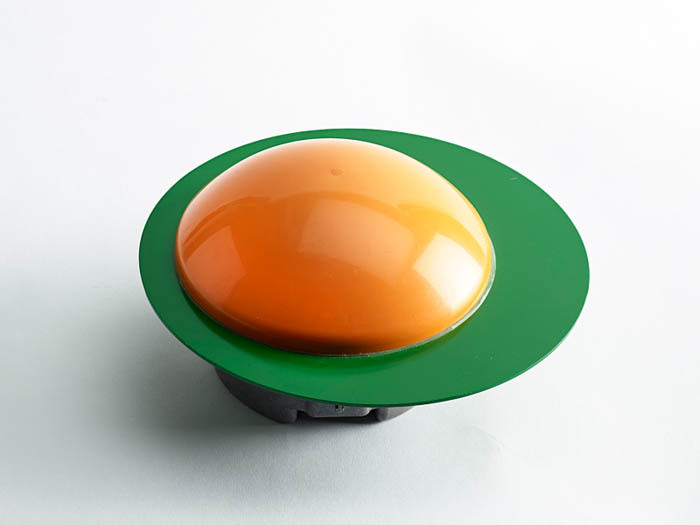 In 1996 John Deere's first production GPS receiver, nicknamed "green eggs and ham," brought the possibility of satellite control to the tractor cab. 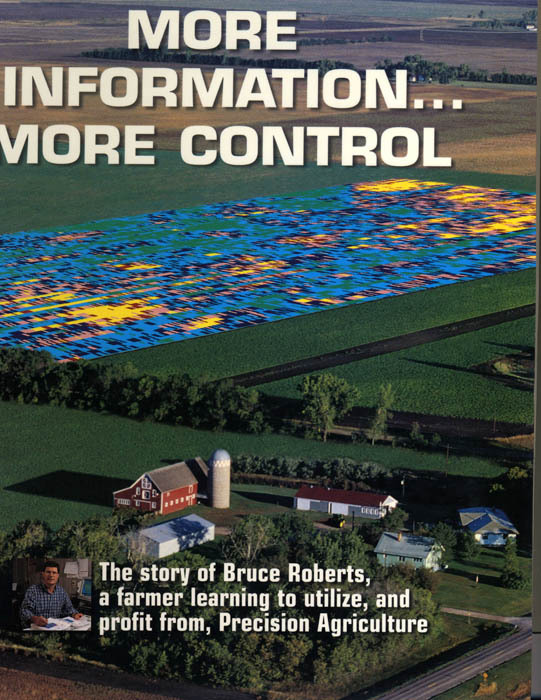 In 1996 John Deere's first production GPS receiver, nicknamed "green eggs and ham," brought satellite control to the tractor cab. GPS wasn't the only new technology making its way to farmers. Crop yield monitors mounted in combine cabs enabled farmers to see the size and moisture content of their grain harvest on the go. The monitors revealed information about the strongest and weakest portions of their fields. 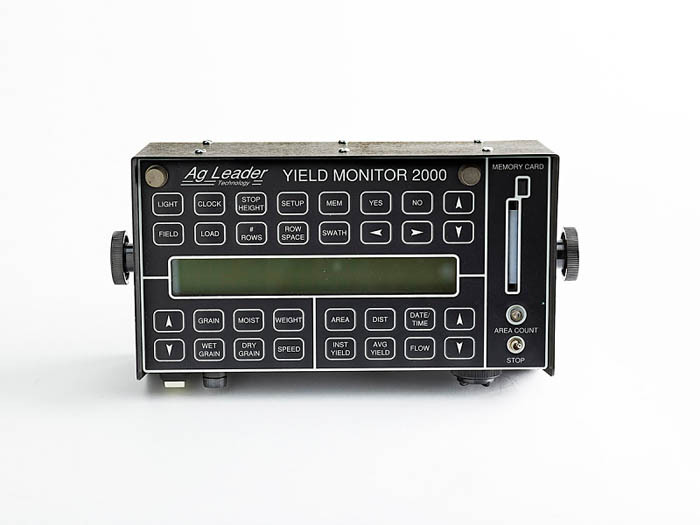 Al Myers successfully developed an on-the-go crop yield monitor for use on combines. He made it even more useful by linking and recording the GPS location. While GPS started as a military product and its civilian use was expanded by one of the most prominent companies in agriculture, the development of one of the first crop yield monitors started as an engineer's dream to be his own boss. In the 1980s, as the recession hit and his day job looked risky, Al Myers decided to create his own business. On nights and weekends Myers worked for six years to invent a digital crop yield monitor. He taught himself electronics and microprocessor programming. He tested it secretly on his father's farm. Finally he quit his regular job and put the monitor on the market in 1992. That year he sold a grand total of 10 monitors. Despite initial slow sales, Myers persisted. By 1995 he had sold 1,500 units. Even seasoned farmers who thought they knew their fields like the back of their hand were surprised by what crop yield monitors revealed about the variation in harvest from place to place. Farm radio broadcaster Lee Kline, describing his first encounter with the yield monitor, said "We were in the [combine] cab and all of a sudden this machine registers 135 bushels, then shoots up to 150, and then to 179. . . . When we came to a wet spot, it would drop down to 35 bushels and then shoot right back up to 169. . . . Astounding!" Linking the yield monitor data to GPS-plotted locations, farmers created yield maps, making the new technology even more powerful. 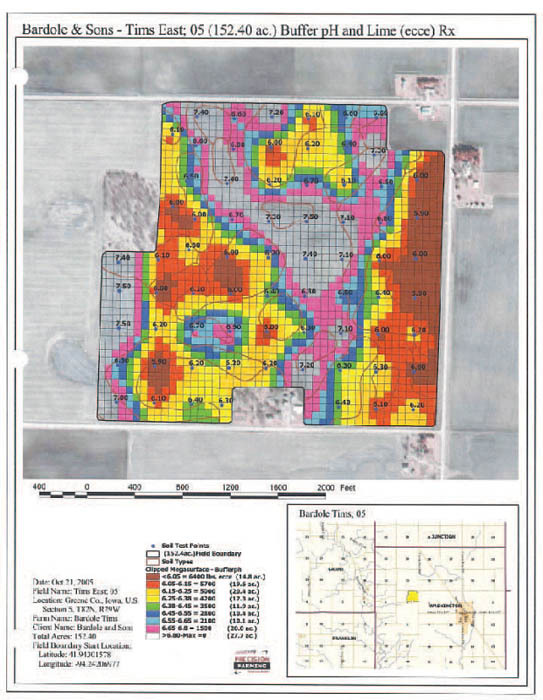 Yield mapping let farmers see where their harvest was weak and encouraged strategic improvements. It also allowed them to compare changes from year to year. Colorful maps show farmers how their soil and harvest differs from one part of the field to another. Courtesy of Roy Bardole. As yield map technology was developing, so were other precision farming tools. Taking advantage of GPS signals, engineers designed systems that allowed tractors to steer themselves through the fields. Auto steer meant farmers could work longer days during the short planting season and keep their rows straighter. Similarly, soil mapping and variable rate application of seed, fertilizer, herbicides, and pesticides saved farmers money as those materials could be applied only where needed. The use of auto-steering technology is what really drove farmers initially to adopt precision farming practices. By the early 2000s, precision farming began to be widely adopted, moving from a novelty to a necessity. As corn and soybean farmer Dennis Lindsay from Masonville, Iowa, said, "I wouldn't farm without computers any more than I would without a tractor." Peter Liebhold is a co-curator of the American Enterprise exhibition.